SoftShut HingesTo add a gentle touch and feel, SoftShut hinges softly pull the door closed for you. 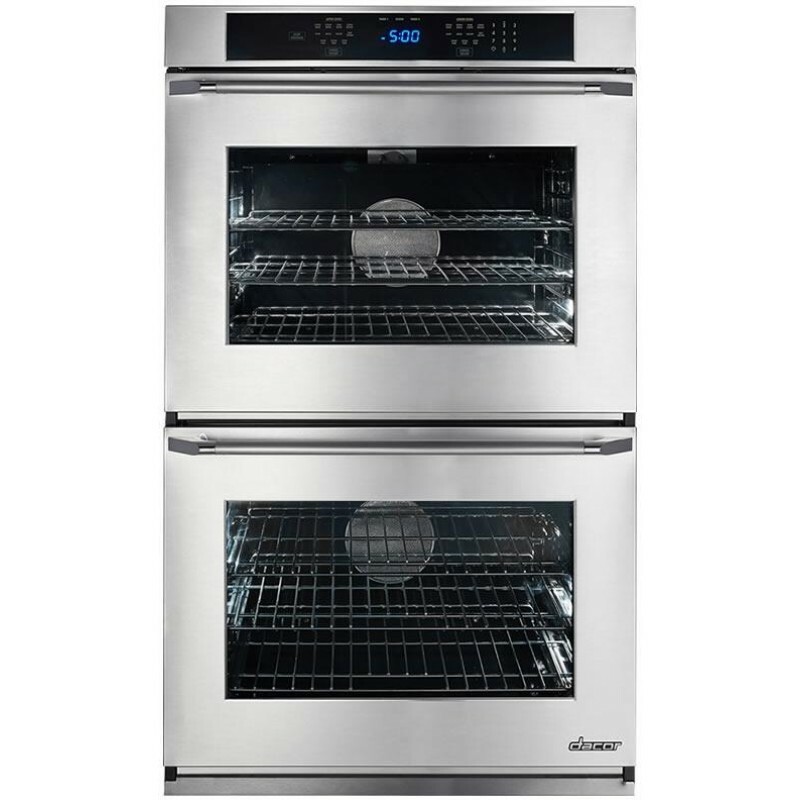 Combined with Dacor's signature features this is all together a truly remarkable oven. GreenClean Steam Cleaning TechnologyGreenClean steam cleaning technology takes the chore out of cleaning. This feature cleans light build-up in 30 minutes without the use of high heat or harsh chemicals. Electronic Control Panelwith Glass Touch controls and innovative control functions. 4.8 cu. ft. Oven Cell Capacity4.8 cu. ft. oven cell capacity to accommodate large dishes and meals. Exclusive Four-Part Pure Convection SystemExclusive four-part pure convection system (in each oven cell) with fan, convection heating element (2200W), air baffle and convection filter, reduces cooking time, provides superior heat distribution, and eliminates flavor transfer. Rapidheat Broil Element (3500W)Rapidheat broil element uses an 8-pass radiant ribbon element to broil food quickly and evenly. 6 Cooking Modes6 Cooking modes (in each oven): Pure Convection™, Convection Bake, Convection Broil, Convection Roast, Bake and Broil. Jet Black Porcelain Oven CellJet black porcelain oven cell won't discolor with frequent use. ​7 Rack Positions7 rack positions for multi-rack cooking. 2 GlideRacks2 Glide racks and 1 Chrome rack in each oven cell. GlideRacks fully extend out of the oven using a smooth gliding ball bearing system for moving heavier dishes in and out of the oven easily. GlideRacks and Chrome racks are equipped with a convenient handle in front for a secure grasp. ​Halogen LightingHalogen lighting provides improved visibility of what's cooking. Digital Temperature ProbeDigital temperature probe connects to controls and switches oven into Automatic Hold when desired internal food temperature is reached. Automatic HoldAutomatic hold switches oven into a keep warm mode when desired cook time is complete so you won't overcook your food. Dehydrate and Proof SettingsDehydrate and proof settings for more advanced culinary enthusiasts. Control FeaturesDelay Timed Cooking, Timed Cooking, Automatic Hold, 10-Key Pad, Clock, Two Timers. 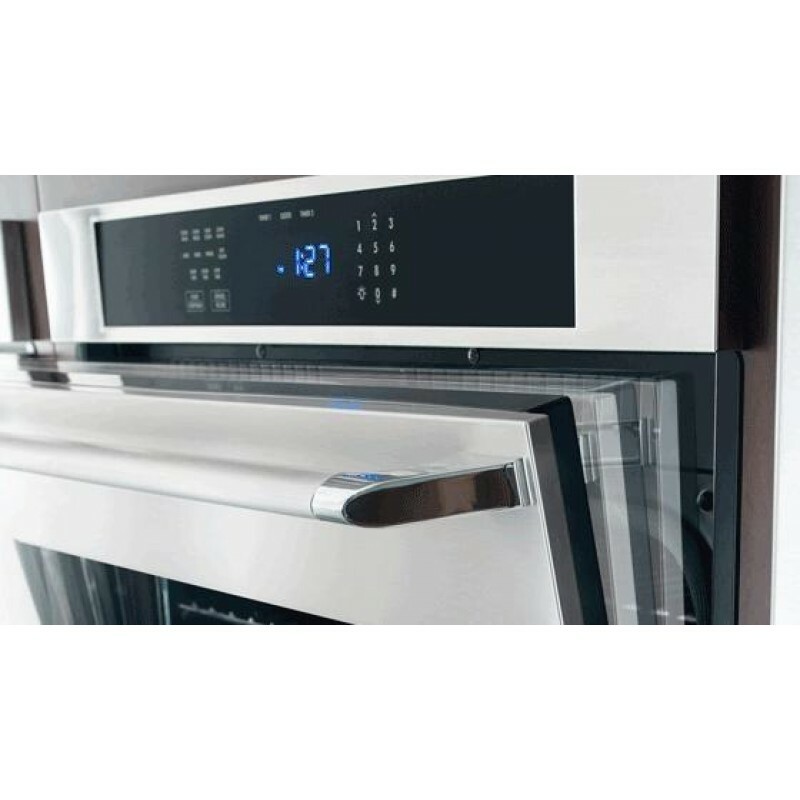 Reverse Air Flow Cooling SystemReverse air flow cooling system keeps oven door temperature comfortable to touch.